Hydrostatic testing is where, pressurised water is pumped into a leak tight system. Once the system is pressurised the system can expand, forcing water out any possible crack, holes or defects. The amount of water that leaves and returns to the system is used to determine whether the tested system passes or fails the hydrostatic test. A hydrostatic test is a test which measures the strength or structural integrity of pressurized system that hold a liquid or gas. Systems that may be tested include boilers, gas cylinders, valves, hoses or the pipes in a water system. The test ensures that there aren’t any leaks in the system and that it is structurally safe to operate. 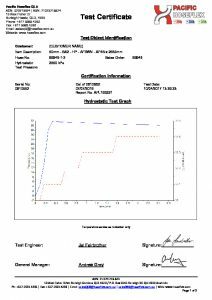 Hydrostatic tests are considered the most common and standard strength testing method in piping and hose systems because of the level of safety require in comparison to Pneumatic testing. 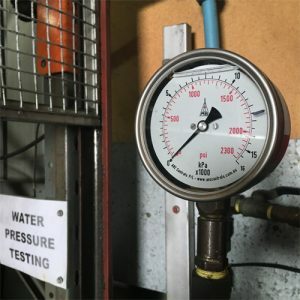 This test can be very effective increasing quality standards with only a few cost effective pieces of equipment such as a pump, gauge and personal protective equipment.